Donald Trump. Photo: Gage Skidmore via Creative Commons. 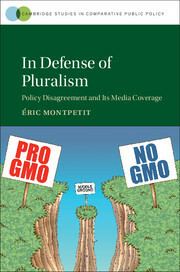 Éric Montpetit, author of In Defense of Pluralism: Policy Disagreement and its Media Coverage (2016), takes a look at how the media handles political stories. I love politics as much as I hate the way the media talks about it. Even in the most serious newspapers, policy-making stories prominently feature villains and intractable disagreements. The media constantly laments political distortions by narrow interests in policy processes and loudly call for rooting this policy-making out of politics. The press displays a clear preference for the methods of the expert-scientist, unfairly presented as apolitical. Qualified expert-scientists, the media has it, should make policy, not interest groups, nor politicians. In short, not much in the press is likely to make citizens feel that those whom we have to trust as guardians of the common good in democratic societies are doing the job adequately. I spent the last dozen of years or so observing biotechnology actors in North America and in Europe and my story of policy-making over this divisive issue differs sharply from the media story. By large, most actors have nuanced and moderate beliefs about the risks and promises of biotechnology. These actors no doubt disagree among themselves on how best to serve the common good, but they know full-well that policy-making is a collective process that requires a mindset of compromise. Each actor has a clear sense of how useful a role she can play in crafting solutions while avoiding mistakes. To be sure, a small minority of actors suspects that capitalistic impulses make biotechnology developers loose sight of the common good to focus exclusively on their narrow interests, but even these actors can be viewed as relatively reasonable. In the past dozen of years of research, I have not come across a single biotechnology actor whose purpose was to overthrow the economic or political system. If some actors sometimes appear radical, it is simply that they play the media game. The goal of the media game is to get journalistic attention and actors who accept to be part of it know that exaggeration is essential to achieve victory. These exaggerations frequently are part of staged performances designed to attract attention rather than to convey information about a policy position, decision or process. In the biotechnology sector, actors who play the media game, in spite of all the attention that they get, are in small number. And while strong in rhetoric, they avoid sabotaging policy processes. Just as the actors who stay away from the media game, they simply follow their own particularly strategy to promote their beliefs on how best to improve our common future. What is problematic here is not media attention to the grievances of the groups actors who play the media game. Rather, it is the level of journalistic attention given to exaggerations. Admittedly, exaggeration attracts readers and viewers who would otherwise ignore political news. Likewise, exaggeration helps columnists and editorialists make their message clear. However, it cannot be denied that exaggeration also creates anxiety in the public about new technologies or events. It sometimes leaves policy actors with no choice but to accept solutions whose only purpose is to appease irrational fears, even if the cost of accepting these solutions is a further deterioration of problems. Exaggeration certainly leaves media consumers with a wrong impression of policy-making. It feeds into their disillusionment about democracy and pluralist politics. If most journalists have a strong sense of their fundamental role in the process of making policy-makers accountable, they certainly neglect reflecting upon the impact of the exaggeration that they air on policy and society. As I am writing these lines, Donald Trump, the candidate in the Republican race, is omnipresent in all media venues. Trump is both, a symptom and a consequence of media’s exaggeration. The importance of the coverage that he receives provides a clear indication of the media’s bent toward exaggeration. And his popularity as an anti-establishment candidate is the result of years of coverage of policy-making and politics that can only inspire disillusionment among citizens. The media’s game, even if played by a small number of actors, carries enormous drawbacks.